You may remember the Water Cube as the venue for the swimming events 2008 Beijing Summer Olympics. The exterior of “The Cube,” with its translucent walls that seemed as though they were made of giant living skin cells, became one of the iconic images of the games. The Water Cube received a lot of press at the time of the Olympics. But what most reports (including Spot Cool Stuff’s own review) left out was that the building was not designed to permanently host of swimming competitions. From conception, its real intended purpose was to be a water park. Recently the Water Cube’s original destiny was fulfilled with the opening of the Happy Magic Watercube. (Yes, somehow “water cube” got truncated to one word during the transition). 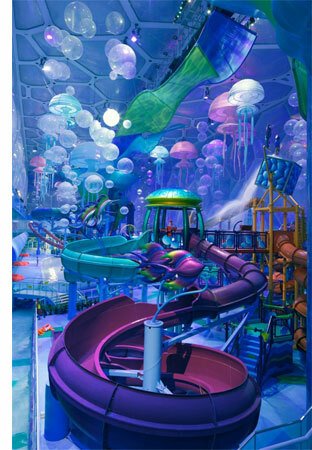 In doing so, the place where Michael Phelps once set world records in swimming is today setting the record as the world’s largest indoor water park. 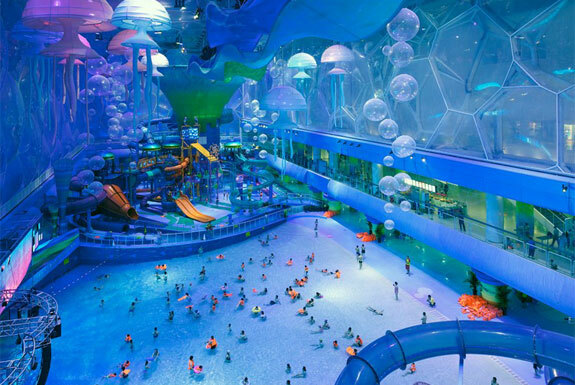 Happy Magic Watercube boasts more than 50 water slides and 18 water rides and enough space for 30,000 swimmers. Happily, the place has much more than mere size going for it. The interior design of the Watercube is even more architecturally weird and wonderful than the exterior’s. Giant amoeba figures hang from the ceiling. Jellyfish shaped blobs float around in the water. Fish mobiles spin overhead. Water tubes criss-cross everywhere. A lazy river circumnavigates the scene. Take all that, add a rich blue and pastel color scheme, and you have a scene that’s like something from Dr. Seuss on steroids. As much as we like the design of Happy Magic Watercube, what bumps it up from glorified swimming pool to worthy attraction are the water rides. Especially cool: The Tornado—it spins you around and spits you out after a long water tube vortex. What’s decidedly unhappy about the Happy Magic Watercube is the price. Admission is 200 yuan for an adult, 150 yuan for a kid (under 1.5 meters tall). Add meals, transportation and the separate admissions ticket to former Olympic grounds and a outing to Happy Magic for a family of four will easily set you back US$150. That’s a lot for a day at a water park. But then the surreal Happy Magic Watercube isn’t just any water park.